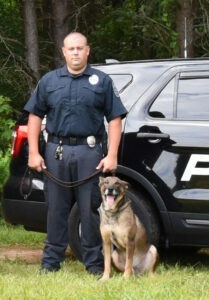 K-9 Taz is retiring due to his age after eight years of service with the Gastonia Police Department. On March 19 Gastonia City Council awarded Taz to his handler, Casey Justice, who was recently promoted to sergeant and has agreed to provide for his partner without cost to the City. Taz is about 9½ years old, and has been a tremendous asset to the Field Services Division. 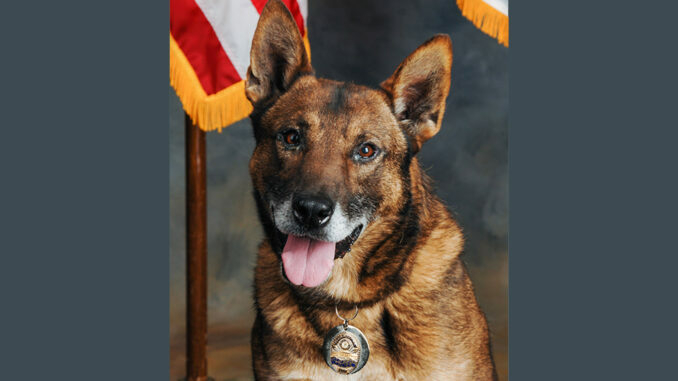 During his career Taz has been deployed in over 200 tracks. The tracks of fleeing suspects led to the arrest of 59 offenders, and Taz is responsible for the seizure of more than $94,000 worth of narcotics. In 2018, Taz was recognized with an award from the U.S. Police Canine Association for apprehending an armed subject who had robbed a convenience store in Gastonia. 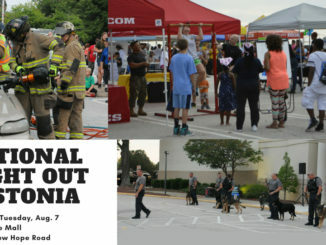 In addition, Taz has conducted 44 article searches, 71 building searches, 128 calls for narcotic searches, and 47 cases of perimeter security during active crime scenes. Congratulations to Taz and Sgt. Justice on Taz’s retirement!